Which 3D Software is Best for Me? Click above for full resolution PDF! Decide on the goal first. Sometimes the simplest answer is the easiest to deal with. Will the final model be used to represent something either on screen or on paper? Chances are, you can save a ton of money and hassle if you don’t need to CNC something out or 3D print it and just stick with a software package that can simply render out the visuals for selling to customers or clients. In house at CCD we use Rhino 3D. It is a great balance between a software that can sketch up ideas, but then we can use those models for both rendering and also our engineers can take those models and use them for developing prototypes. This is a sticky topic because a lot of software is “free” with limited usage such as SketchUp or Blender or even Rhino 3D (Full functionality but only 25 saves allowed). So consider the robustness of what you need and pick a number that fits what you can afford. Like in fashion, where the pants that fit, not the pants you wish you’d fit…or you’ll be very very uncomfortable. One topic that isn’t really talked about tat much is whether or not your model will need to have numeric adjustments made as the program develops. Parametric modeling such as Solidworks offer numbers that represent measurements to be changed on the fly and things will update automatically. However, with Rhino, to get that sort of function, you need to install 3rd party plugins to get the same amount of flexibility to a program like ZBrush where you are pretty much “painting” polygons in 3D. There, you’ll have more artistic freedom, but way less numeric control. 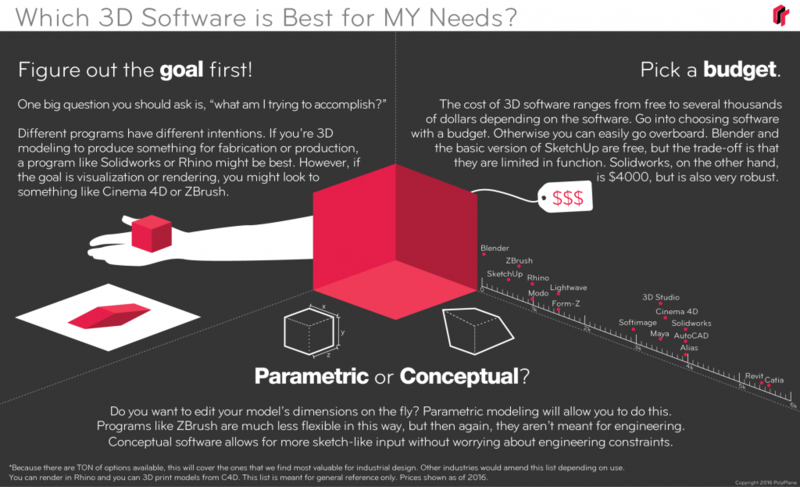 Consider this as well when picking out your 3D modeling software and you’ll save yourself a ton of time. By the way, is your favorite social media Twitter or Facebook? Yeah? Us too! Follow us for regular content on design theory, ProTalks, and technical videos that will give you even more ways to #beabetterdesigner. Stay tuned!